I thought it would be fun to play with dark chocolate to see what I could come up with. 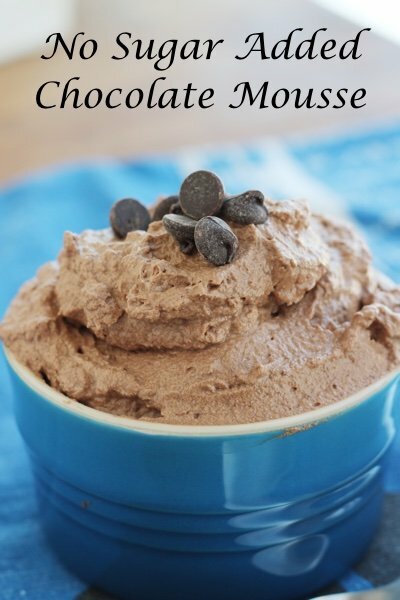 This recipe calls for no sugar (and no artificial sweetener) though I will say that 70% chocolate has sugar added – and heavy cream has lactose – so this isn’t to say that the recipe isn’t sweet. Before I made this recipe, I thought it would have a low points value for my WW readers – boy, was I wrong! I didn’t think about the saturated fat when I attempted this. On the other hand, for those trying to avoid sugar in desserts – this is a good choice. I think next time I will cut this in half and serve ¼ cup over a big bowl of fresh strawberries – chocolate, cream, and strawberries – sounds yummy, no? In a microwave safe bowl, add ¼ cup boiling water. Mix in instant coffee, vanilla, and add chocolate – breaking up the pieces. Heat in a microwave for 20 seconds until the chocolate is just melted. 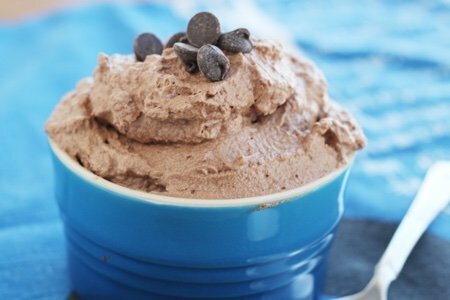 Blend coffee and chocolate in bowl until you have a uniform mixture. In a stand mixture, beat whipping cream until you have stiff peaks. Fold in the chocolate mixture and store in refrigerator for 30 minutes. Serve immediately or store for a later date. This is such a GREAT site!!! Thank you for sharing great recipes and WW tips!!! Mmmm. The wheels are turning! Yes to the strawberries with chocolate whipped cream! I'm wondering how this would freeze for an ice cream with no nasty ingredients plus to be easier on portion-control. A quarter-cup frozen treat would go nicely with fruit too. Or maybe frozen then rolled in grated coconut, chopped nuts or drizzled with more chocolate and a cherry?. Thanks for creating this lovely dessert! This looks like a real crowd-pleaser and looks fancier than the recipe requires the cook to be!!! Thank you! Could you just mix it with fat free whipped topping instead of the heavy cream? commenting on another one of your recent posts: If you or your kids would like to continue to enjoy seafood longterm, please do not ever buy canned tuna from unethical companies like bumble bee, chicken of the sea, starkist etc. If possible, buy the wild planet tuna brand (look for the light/skipjack variety which is lower in mercury). Also, aim to eat lower on the food chain and buy sardines, anchovies, or mackerel as an alternative (cheaper too). I would love to see a post dedicated to this issue and other food sourcing issues in the future. Sifting through all the information out there in an attempt to make informed purchasing decisions can be exhausting. @knowyourfoodsources: Yes! I wanted to comment on Feb 14th post but it was not available? For years and years I avoided tuna (and missed it) until I learned about Wild Planet Tuna--it is more expensive but healthier due to less mercury plus you can see and taste the difference due to their processing. You get virtually no water, just solid packed tuna! Healthier and better quality. For those who are raising children or grand children, please take the time to view this very important documentary in its entirety. @BarbL and @Knowyourfoodsources - thank you for your informative comments. The tuna post had problems with comments yesterday - argh! I appreciate you sharing your views here. Looks really tasty. I am n not sure, but according to your description this is a kind of a healthy thing. So, I would like to try it somehow. We are glad to help you a bit. I make it with the non fat frozen whipped topping and really like it. The more chocolate the better! And it's really easy! This is a perfect recipe for my wife, she doesn't have diabetes, but she doesn't actually like sugar. This looks great, but no where do I actually see what the weight watchers points are. Please let us know.